Welcome to the Beijing Chaoyang District Maps Menu at China Report.com / www.Drben.net. 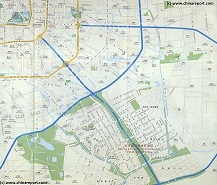 The Below Menu Page gives Quick and Easy Direct Access to Maps of Chaoyang District and Landmarks used in THE BEIJING REPORT, a part of ChinaReport.com. Chaoyang District once a drab industrial suburb now serves as the glamourous Central Business District of Beijing. Apart from a few historic landmarks most of the District is fully modern with many shopping malls and cultural venues as well as parks to visit. A large section is reserved for Embassies and Consulates. The architecture of the district keeps changing, making it one of the most interesting districts in the Metropolis. A guide map to Holiday Inn Lido, China International Exhibition Center, Sheraton Great Wall Hotel and the famous Art Factory 798 at the Dashanzi Art District. 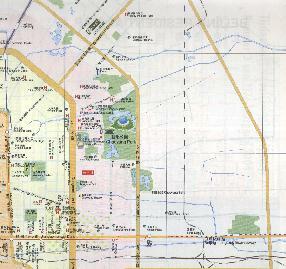 A Geographic Map of North-East ChaoYang District (2007). This Map shows the North-East Half of ChaoYang District focusing on the Main Landmarks and the most developed parts of the rapidly transforming ChaoYang District in the West. Borders are in the West (Left) The 3rd Ring Road, in the South the Main Railway Line leading East out of Beijing Main Railway Station south and below JianguoMen Outer (Nei) Street (Dajie'). Find Silk Alley, the Place, various Embassies and More on the Map ! 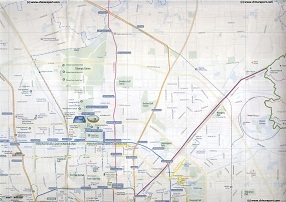 A Geographic Map of North Central ChaoYang District (2004). This by now dated Map the north central Chaoyang District and the trajectory of the Airport Expressway between Dongzhimen Shunyi District. This map roughly covers the area between Andingmen in the Dongcheng District in the south west, the Olympic Center (not completely on the map) in the north west, the Dashanzi Art District in the north east and Sun Park and the top of Chaoyang Park in the south east. Landmarks include Lama Temple, Ditan Park, Sanlitun Bar Area, north Embassy District, University of International Finance and Economy, Lufthansa Center, Sun Park, Chaoyang Park and more. Geographic Map Dongcheng-ChaoYang Districts (2007). 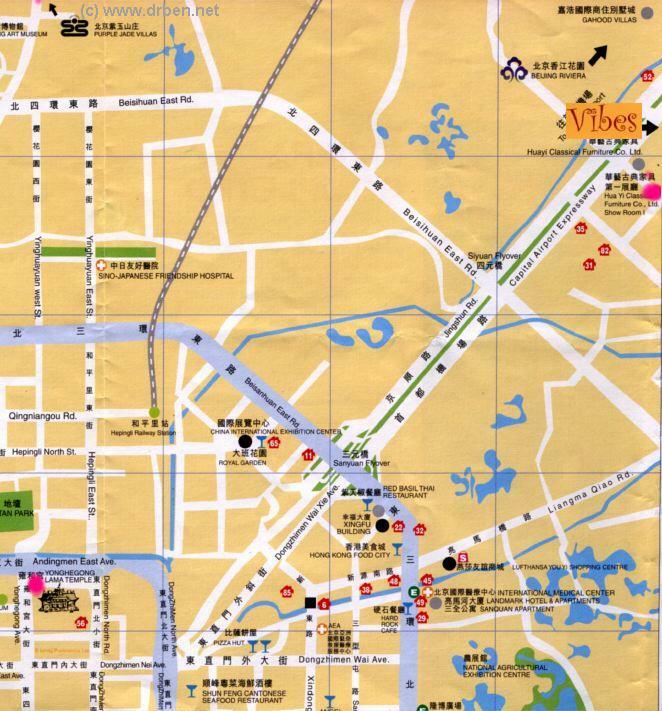 This detailed geographic offers an at a glance overview of both the Dongcheng District and Central portion of the much larger Chaoyang District and all Monuments, Landmarks, hotspots and places of interest there in. 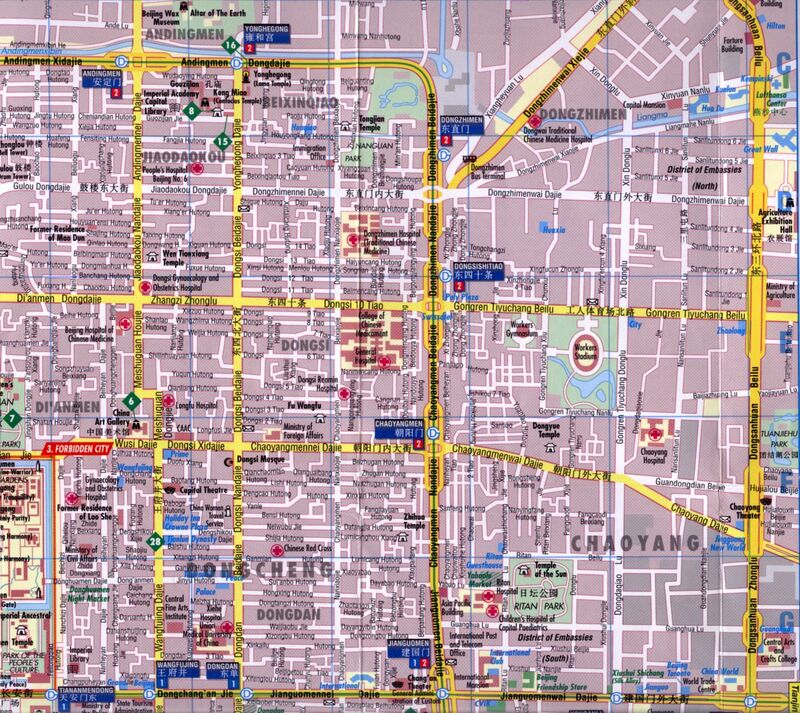 Viewable land area includes all between the Forbidden City in the south west, Ditan Park in the north, the 3rd ring road in the east and Jianguomen Outer Street in the south. 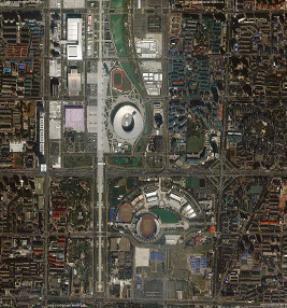 Notably, this includes a large section of what has become the CBD Central Business District of Chaoyang. Latest architectural landmarks and facilities are included.